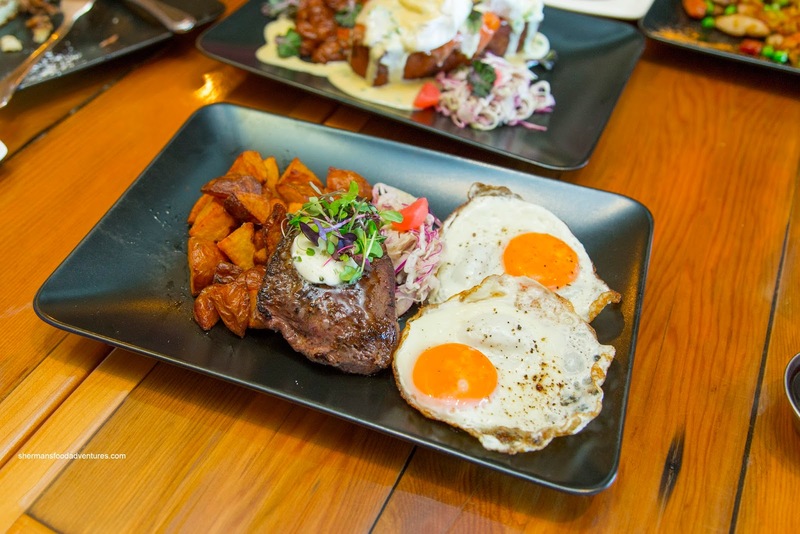 It wouldn't be too much of a stretch to call Vancouver a brunch town. Yup, for some reason, people are willing to shell out upwards of $20.00 (and sometimes beyond) for glorified breakfasts. Sure, there are some spots that serve up more interesting eats such as Yolk's, Red Wagon and Medina, but most, if not all charge a premium. I'm not saying that I do not enjoy the occasional meal at the aforementioned spots, but the lineups at the last 2 doesn't do it for me. 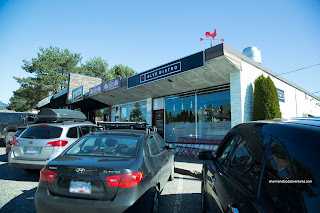 Hence, it brought me to BLVD Bistro in North Van. Okay, the lineups still exist here because they only have 3 tables for 4 available, but their menu is game-changing (as they proudly state). Due to the lack of seating, we gave up the first time and returned the week after. We still had to wait for about 30 minutes... on a weekday! Anyways, I got right down to business with the El Paella de Patron. One bite, and it was clear that this was a winner. 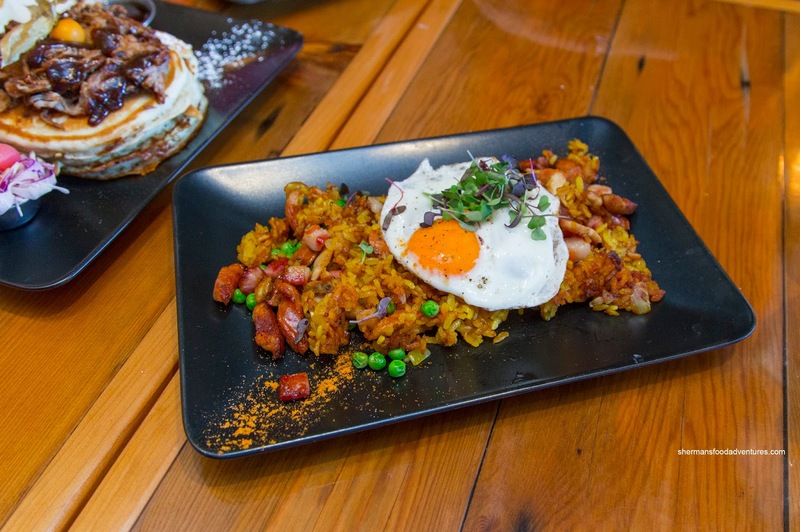 The saffron really came through as well as the fattiness of the chorizo and pork belly. Due to the pan-fry with the oils, the rice was crispy and nutty with a touch of smokiness. Runny and free-range, the the fried egg helped provide some moisture to compliment the crunchy rice. The portion was a bit small, but it wasn't devoid of meat either. For my son, he wanted the Steak n' Eggs. I was skeptical of his choice, but he ended up eating most of it. After sampling it myself, it was no wonder as the 5 oz. flat iron steak was perfectly medium-rare and buttery tender. It was well charred and seasoned with a lemon compound butter. The cubed hashbrowns were aggressively fried where they were crispy while still potatoey inside. 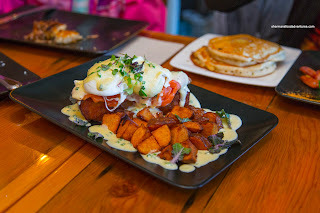 Viv decided on the Upstream Eggs Benny that featured a large brink of savoury potato bread pudding underneath the cold-smoked steelhead lox and poached free-range eggs. At first, I was concerned at the heaviness of the bread pudding when combined with the Hollandaise. However, this wasn't the case as it soaked up the perfectly runny egg yolk and lemon chive Hollandaise becoming soft and almost fluffy. As for the Hollandaise, it was airy and light with a balanced amount of acidity. They didn't skimp on the buttery smoked salmon either. 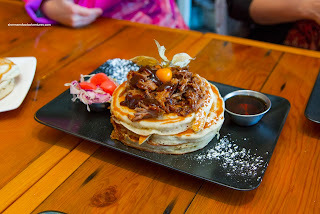 Our last item was the Pulled Pork Pancakes with maple bourbon syrup. These slightly dense, yet still fluffy pancakes sported a appealingly crispy exterior that held up well to the moisture. The pulled pork was tender and meaty while slathered in a smoky hickory BBQ sauce (tasted similar to Bulls-Eye). This was balanced off by the sweet and boozy bourbon syrup. Okay, I'll get right to the point here... Sure, BLVD Bistro is not exactly cheap nor is there enough seating, but really, it's worth the visit. Love love love this place!! And Sansho across the street is owned and operated by Japanese. The majority of their clientel are Japanese too which is always a plus in my books.